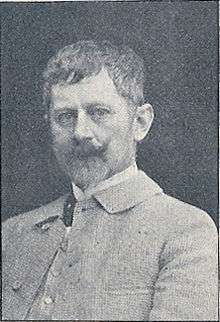 Gustav Johannes Wied (6 March 1858 – 24 October 1914) was a Danish writer. 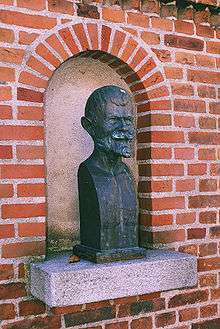 The fifth of the eleven children of Carl August Wied and Catha Wied, Gustav was born in Branderslev near Nakskov. He is generally known as a satirical critic of society in his time and he deliberately used his writing talents to expose the establishment, bourgeoisie and ruling class. The government had him imprisoned for 14 days in 1882 for a short story published in a newspaper. Wied wrote novels, short stories, poems and plays (including several satyr plays). His best-known work is the Livsens Ondskab (1899) novel, depicting life in a small provincial Danish town, with the customs official Knagsted as a red-bearded satyrical Diogenes openly ridiculing the hypocrisies of the snobbish bourgeois inhabitants, and Emanual Thomsen as a tragic struggler, trying to obtain the funds needed to regain his ancestral farm. In Knagsted (1902) he created a sequel, letting Knagsted comment on contemporary fashionable society in the Bohemian spa resort of Karlsbad (Karlovy Vary). He eventually lost popularity and suffered from severe stomach aches. Badly affected by his condition and despondent, he committed suicide with an overdose of potassium cyanide in 1914. John B.C. Watkins, The life and works of Gustav Wied, Ithaca, N.Y., 1944.